Anders Lindback had a terrible season. Most can agree on this. But, now that the off-season is here for the Tampa Bay Lightning, the big elephant in the room is what Yzerman will do with him now. Lindback’s contract expires this summer, which means that, if Yzerman decides not to renew Lindy’s contract, there’s an open space on the Lightning’s goalie depth chart. Ben Bishop, obviously, will stay at the number one position. But, there are plenty of options as to who will be the new backup. In the first section of this three part series, we’ll look at the first, most obvious option available: keeping Kristers Gudlesvkis around for the fall. 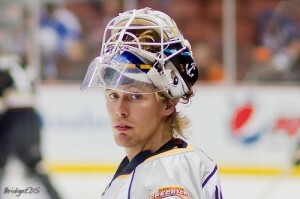 After Bishop’s injury, Gudlevskis was called up from the minors to backup Lindback. He only played in one of those three remaining regular season games. In that game, he allowed only two goals, stopping 35 shots against the aggressive Columbus Blue Jackets. Even though he came away with the win, Gudlevskis’ true accomplishment took place in Sochi. Gudlevskis started between the pipes against Team Canada in the Olympics. In these sixty minutes, the Latvian brick wall defied all odds by stopping 55 out of 57 shots. The game itself was tied 1-1 until the final half of the third period, leaving Team Canada fans biting their nails in fear of being eliminated. Playing in the Olympics is one thing, but nearly defeating a Canadian Olympic team, blocking shot after shot from players such as Sydney Crosby and Corey Perry, is an accomplishment nothing short of greatness. And, when Gudlevskis finally made his NHL debut, he did so with astonishing style and impressive skill. Then, when playoff time came and Bishop was still not ready to play, Gudlevskis shone even brighter. One of Cooper’s biggest mistakes during the Lightning’s brief playoff run was not giving the Latvian an actual post-season start. Though Lindback played exceptionally (and uncharacteristically) well, it should have been expected that a goaltender with Lindback’s track record would eventually plateau. Game 4, however, was an example of the Gudlevskis’ potential. Trailing 1-3 against Montreal, Gudlevskis relieved Lindback in the 3rd period. The goalie substitution served as both a mental and physical regeneration for the Lightning, who scored two goals in two minutes. All the while, Gudlevskis stopped all 17 shots faced by Montreal. And, right when it looked like Tampa Bay might force overtime as well as an extended series, a penalty was called against Tampa Bay. Gudlevskis still looked dependable despite his team being a man short, but, one can’t blame him for allowing a late third period goal. One can only impressed that he played as well as did considering the fact it was only his third NHL game. Despite his proven abilities, it must also be remembered that Gudlevskis has never been seen on the NHL level for an extended amount of time. Goalies have stepped into the NHL, played better than their team’s starters, only to go down hill. A perfect example is the Kings’ Martin Jones, called up from the AHL after Jonathan Quick was injured. Jones tied the NHL record for best rookie debut with 8 straight wins, three of which were shutouts. In that 9th game, Jones allowed four goals. In two of the next three games, Jones also allowed four goals. Though keeping Gudlevskis would be a great idea, it’s also sort of a gamble. And, what Tampa Bay cannot afford in their current position is taking risky chances. The best option is to keep an eye on Gudlevskis in the AHL, where he can continue to improve his game alongside other Bolt Prospects. He should definitely be the Lightning’s go to guy if Bishop gets injured again. In the end, if it comes down to a question of Gudlevskis or Lindback, Gudlevskis should be called up and Lindback sent down. Then, and only then, can we see extended play by Gudleskis on the NHL stage. 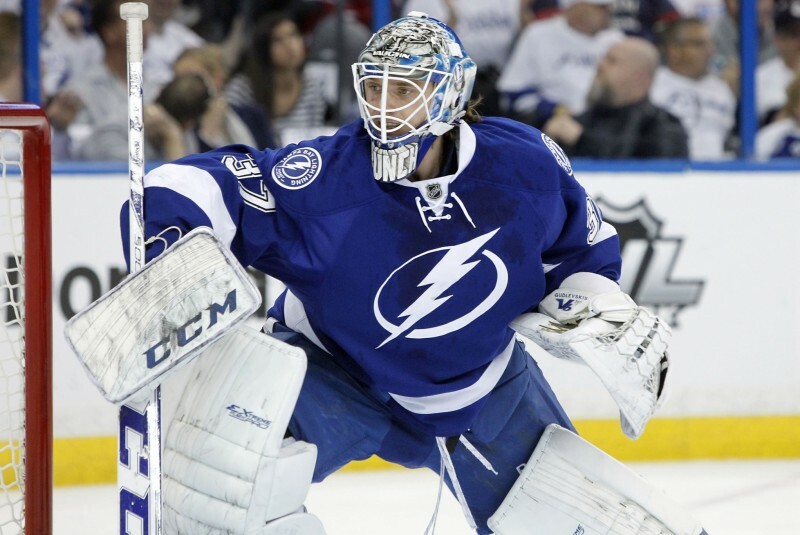 However, the Lightning have other options other than Gudlevskis. One of those options is still over in Russia, but that may not be for much longer.